Surprise dad this Father’s Day with a framed poster he will enjoy year-round. 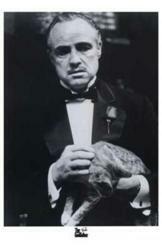 The Godfather poster makes a great gift for Father's Day. PosterNation.com offers its customers a wide variety of gift choices for any celebratory event. To celebrate dad this June, design specialists from PosterNation.com created a list of the top five gift ideas for Father’s Day. Art prints are versatile, so shoppers can choose from thousands of different gift choices to find a gift dad will appreciate and love. Dads, grandfathers and husbands will enjoy their favorite sports posters throughout the year with this gift that is sure to be a winner. Motivational and inspirational art prints are available with a variety of messages. With so many options available, PosterNation.com has the perfect inspirational poster for every dad. Fathers who have an interest in architecture will love the assortment of framed art prints at PosterNation.com. There are Italian, Greek, Roman, American, French and many more styles of architecture art prints available. Funny or humorous posters are perfect for any man cave. Novelty, humor and joke posters are sure to make dad smile this Father’s Day. Whether he loves comedies, scary movies or action flicks, PosterNation.com has a movie poster that dad will be proud to display in his theatre room.